Researchers with Air Methods Corporation recently published the results of their novel airway management curriculum in Prehospital Emergency Care. The curriculum, known as the Helicopter Advanced Resuscitation Training (HeART), focuses on combining critical thinking on the part of providers with established best practices in airway management. This 25-month retrospective observational study includes over 5,000 patients that underwent rapid sequence intubation (RSI) by providers stationed at one of 160 air medical bases across the U.S. Providers were trained in the HeART curriculum during orientation and then received follow-up training through a series of labs during the study period. Of the 5,893 patients that underwent intubation attempts, only the 5,132 intubations done using rocuronium or succinylcholine were included in the final analysis. The primary outcome was first-intubation success while the secondary outcome was overall intubation success without desaturation. Waveform capnography was required for tube confirmation. First-pass success saw a statistically significant increase from 85 percent at the start of the study period, to 95 percent by the end. First-pass success without desaturation saw similar improvements going from 84 percent to 94 percent. While not statistically significant, overall intubation success went from 95 percent to 99 percent during the study period. Preoxygenation is performed to target oxygen saturation (SpO2) values > 93 percent, employing supplemental oxygen via nonrebreather mask, assisted ventilations prior to RSI using bag-valve-mask, and post-RSI BVM ventilation with larger tidal volumes and longer inspiratory times. The “two-thumbs up” approach to BVM is employed. Hypoxemia, extremes of size, anatomic challenges, vomit/blood/fluid, exsanguination, neck mobility issues (HEAVEN) criteria are used as a screening tool for difficult airways and to guide selection of video laryngoscopy or direct laryngoscopy. Providers are taught “shallow-to-deep” blade insertion for VL and “deep-to-shallow” blade insertion for DL. Individual attempts are abandoned with SpO2 decreasing to lower than 93 percent. Salvage techniques are strongly recommended after three failed ETI attempts. A unique taxonomy for failed attempts is used to guide the approach to subsequent attempts. A laryngoscope is used to facilitate supraglottic airway insertion. Providers learn a “tactile” approach to surgical cricothyrotomy. Here are some memorable quotes from the study. Here are the top takeaways from the study. RSI is one of the most dangerous procedures performed in the prehospital setting, rendering the patient completely reliant on EMS to not only breathe for them, but do so in a way that ensures long term positive outcomes. Historically, intubation has been seen as a success or failure based solely on eventual tube placement. The shift in focus towards placement without desaturation is a critical next step as a growing body of literature shows just how bad short-term hypoxia is for the brain. As the data and information infrastructure within EMS strengthens, so too do the technologies by which we can retroactively review interventions. Some would argue this level of oversight could be a bit “big brother.” But the reality is likely to create an additional opportunity for learning on the part of the providers, thereby increasing the quality of care they can give to their patients. 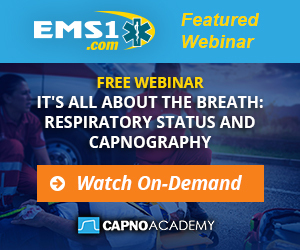 Capnography matters. It is a reliable and well-vetted mechanism for identifying tube placement. While the physical tubing can occasionally become clogged, when functional, the EtCO2 provides critical insight into the location of the tube as well as an additional vital sign relating to the patient’s condition. Continuous quality improvement is an ever expanding arena within medicine. A growing number of publications are shining a light on its utility in the prehospital setting, particularly as it relates to high risk procedures such as RSI. EMS agencies choosing to perform RSI, or similarly dangerous procedures, without any such oversight should reconsider if their protocols truly have the best interest of the patients in mind.